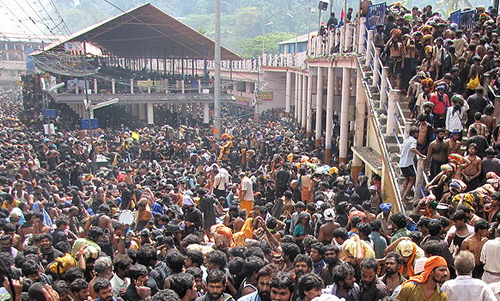 Sabarimala is a famous pilgrimage destination in Kerala and the annual festival is attended by thousands of people from all across the world. The devotees who visit the temple during the festival walk barefoot through the uneven road to reach the temple. KSRTC operates special service in connection with Mandalapooja Makaravilakku 2012-13 from various depots namely TVM Central, Punalur, Kottarakkara, Chengannur, Kottayam, Erumely, Pathanamthitta, Ernakulam, Kumaly, etc… KSRTC provides safe and comfortable journey to the pligrims from different centres in Kerala. Pamba Bus Station restarts its functioning and the NILAKKAL – PAMBA Chain Services will be introduced in addition to long distant services to various other destinations according to the traffic demand round the clock during the festival season. Online Seat Reservation avilable round the clock at PAMBA Bus Station during the festival season and 18 Online reservation counters in these centers: Trivandrum Central, Kottarakkara, Kottayam, Munnar, Ernakulam, Thrissur, Guruvayoor, Malappuram, Valancherry, Palakkad, Kozhikode, Kannur, Sulthan Bathery, Kaseragod.